Bramley Care has recently acquired new interactive pets in their residential homes (The Old Rectory, Stalbridge and Bramley House, Mere). These cats and dogs look and feel like real animals. Their life like fur, movements and noises are calming and comforting to residents. This form of interactive companionship is particularly beneficial for residents living with Dementia. By using interactive pet’s, we have seen the delight in our residents faces as they spend time interacting with them. 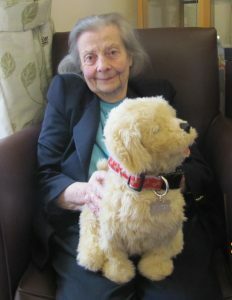 Some residents have become very attached to the individual animals and Bramley have enabled them to adopt the pet, so that they begin to think of them as their own. The residents have then named their pet and a collar and name tag has been given to them. Bramley Care is always looking for new ways for their residents to feel comfortable and at home in their surroundings. These interactive pets are proving to be a great success and we look forward to introducing other new ideas throughout 2018. One of our Bramley House residents spending time with our interactive dog ‘Buster’.